We’re big fans of mesh wireless systems here at BGR. Specifically, the AmpliFi HD mesh system is our favorite and the Google Wifi System is a close runner-up. But Amazon has a big deal of the day going on tons of networking gear, and there’s a Wi-Fi solution hiding in there that costs just a fraction of what you’ll pay for a solid mesh system. 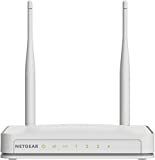 The Netgear WNR2020v2 Wi-Fi Router with High Power 5dBi External Antennas is on sale today for just $17.99, and Netgear EX6120-100NAS WiFi Range Extenders are down to just $29.99 including a $10 on-site coupon. Grab one of each and you’ll blanket your entire home with fast, reliable Wi-Fi for a total of just $48. If you have a giant house, pick up an extra range extender and you’re still well under $100 when all is said and done. You can shop Amazon’s full sale on networking gear right here, or check out these two particular devices below. Extend WiFi up to 1200Mbps. The product may not be compatible with routers or gateways with firmware that has been altered, is based on open source programs, or is non-standard or outdated.